Fueling food swaps to sustain your energy. A proper breakfast has the power to fuel your morning, boost your metabolism, enhance concentration, and set a positive tone for the rest of the day. Sadly, standard American breakfasts have been shown to do the exact opposite — excess sugars and refined carbohydrates hide in granola bars, cereal, processed bread, and even fruit yogurt, and are a recipe for mid-morning crashes and dreaded weight gain. 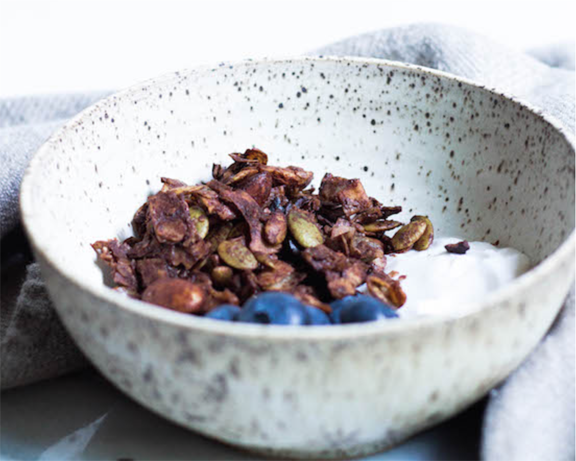 1/ Swap sugary-granola for Grain-free Cocoa Granola. Serve it with banana slices and plain yogurt or milk for a protein, fiber, and antioxidant-filled breakfast with all the crunch, and none of the added sugar. 2/ Swap regular pancakes for Banana Oat Pancakes made with oats and sweetened only with banana. Pancakes are typically packed with sugar, butter, and refined carbohydrates. This alternative is a nutrient-rich rendition of the classic. Skip the maple syrup and you’re good to go. 3/ Swap sugary cereal for Shredded Wheat with milk and sliced banana or berries. If cereal is a must-have, stick to plain, unsweetened, whole grain sources. The first few days may be the toughest, but your taste buds will eventually adapt and you’ll be able to kiss sugary cereals goodbye. And we’re sure you’ll grow to appreciate the taste of fresh fruit as a natural sweetener! 4/ Swap sugary French toast for 5 Ingredient Banana French Toast sweetened only with banana. Similarly to pancakes, french toast can contain a plethora of ingredients with little to zero nutritional value. Try this more nutritious alternative, and remember to use whole grain toast as your base! 5/ Swap sugary coffee drinks for unsweetened tea. Every breakfast needs a better beverage. And let’s face it, a Frappuccino is actually a milkshake masquerading as coffee — you don’t even want to know how much sugar is in one of those bad boys. Ditch the milkshake for Harney & Sons Fine Teas Black Currant. Its fruity, berry flavor will satisfy any desire for sweetness, no added sugar required. Photo courtesy of Anne food. 6/ Swap fruit yogurt for plain yogurt with fresh fruit. One 8 ounce serving of Yoplait Strawberry Yogurt has a staggering 30 grams of added sugar — that’s far more added sugar than one should eat in an entire day! Stick with unsweetened plain or Greek yogurt, and add your own berries or banana for fiber and sweetness without the added sugar. 7/ Swap regular waffles for Banana Coconut Flour Waffles. Believe it or not, these waffles are made mostly from eggs and bananas, making them high in protein, fiber, and micronutrients. Top with whole fresh fruit such as strawberries or banana slices and you’ve got yourself a power breakfast. 8/ Swap maple syrup for unsweetened applesauce and plain yogurt on pancakes, french toast and waffles. One tablespoon of maple syrup contains a whopping 12 grams of sugar, and that’s only a fraction of what people consume in one sitting. Although maple syrup is minimally processed, sugar is sugar is sugar, so make the switch to unsweetened applesauce and plain yogurt for a naturally sweet, creamy alternative. 9/ Swap brown sugar oatmeal for Banana-Sweetened Oatmeal. Brown sugar may be a classic, but it is time oatmeal shines without the added sugar. Slicing bananas into the pot with your oats and milk leads to an equally sweet treat, no brown sugar needed. Add a spoonful of nut butter or top with toasted almonds or pecans for added protein. 10/ Swap jam on toast for nut butter on toast with a side of fruit. Jams and jellies contain fruit, but they also contain a ton of sugar. Stick with a protein-rich spread such as nut butter that will fuel you throughout the day, and fiber-rich whole fruit. And don’t forget to choose a whole grain bread without any added sugar! Once you start making simple swaps like these, your taste buds will adapt and your metabolism will follow suit. Remember — stick to whole fruit for sweetness, and choose fiber-rich, whole-grain sources of carbohydrates. And in general, it’s best if you make it yourself. To learn more about building a better breakfast, download Foodstand’s free app, and join the Avoid Sugar at Breakfast Challenge. Then invite a buddy to do the Challenge with you — to hold you accountable, and congratulate you for sticking with it. Originally published at blog.thefoodstand.com on March 27, 2017.